This is the discography of Pete Seeger as a solo artist. For albums that Seeger released as part of The Almanac Singers (1940-42) or The Weavers (1948-52 & 1955-57), see each group's respective discography. Seeger at the Clearwater Festival, 2007. The discography of Pete Seeger, an American folk singer, consists of 52 studio albums, 23 compilation albums, 22 live albums, and 31 singles. Seeger's musical career started in 1940 when he joined The Almanac Singers. He stayed with the group for two years until he was drafted into the Army. After the end of World War II, Seeger helped found an organization known as People's Songs, along with the influential folk music magazine People's Songs Bulletin. He published several singles and a studio album with the magazine. Seeger would play at People's Songs events, called hootenannies, until the organization folded in 1949. After People's Songs, Seeger and another former member of the Almanacs, Lee Hays, founded the Weavers, who achieved commercial success. In 1952, The Weavers went on hiatus due to the Red Scare; Seeger and Hays both had Communist ties. After the demise of the Weavers, Seeger released a solo album, American Folk Songs for Children, in 1953 on Folkways Records. He continued to release albums on Folkways until he was signed to Capitol in 1961. There is no supporting evidence that this album existed. Asch 352, the catalog number usually quoted for it, was a Mead Lux Lewis album. This was not an album; it was a single 78 record, including snatches of songs interspersed with Seeger's comments. Re-released in 1993 by Smithsonian Folkways. Re-released in 2012 by Smithsonian Folkways. Re-released in 1993, 1993, and 2007 by Smithsonian Folkways and in 2008 and 2010 by Not Now Music. Re-released in 2012 and in 1967 under the name Abiyoyo and Other Story Songs for Children by Smithsonian Folkways. Re-released in 2002 by Smithsonian Folkways. Re-released in 2001 by Smithsonian Folkways. Re-released in 2006 by Smithsonian Folkways. Re-released in 1998 and 2012 by Columbia. Re-released in 1998 by Columbia. Re-released in 1994 by Columbia. Re-released in 1989, 2002, and 2006 by Smithsonian Folkways. Re-released in 2002, 2006 and 2006 by Smithsonian Folkways. Won a Grammy for Best Traditional Folk Album. Nominated for a Grammy for Best Traditional Folk Album. Re-released in 2003 by St Clair as Pete Seeger. Re-released by Mobile Fidelity Sound Lab. Re-released in 1990 by Columbia. Originally recorded privately by Gene Deitch in 1964. Re-released in 1986 and 2010 by Columbia and Wounded Bird respectively. Re-released in 1990 and 1993 by Vanguard. Re-released in 1994 and 2007 by Legacy and Collectables respectively. Re-released in 1995 by Sony. Previously released as Birds, Beasts, Bugs and Little Fishes and Birds, Beasts, Bugs and Bigger Fishes in 1955. Re-released in 2000 and 2012 by Mastersong and Essential Media Group respectively. Re-released in 2001 by Prism. Previously released as American Folk Songs for Children, in 1953, and American Game and Activity Songs for Children, in 1962. "Draft Dodger Rag" — Dangerous Songs!? ^ Unterberger, Richie. "American Folk Songs for Children". AllMusic. Retrieved 1 April 2013. ^ "American Folk Songs for Children Releases". AllMusic. Retrieved 14 May 2013. ^ Ruhlmann, William. "Frontier Ballads". AllMusic. Retrieved 1 April 2013. ^ "Frontier Ballads Releases". AllMusic. Retrieved 14 May 2013. ^ Ruhlmann, William. "Goofing-Off Suite". AllMusic. Retrieved 1 April 2013. ^ Ruhlmann, William. "How to Play the 5-String Banjo". AllMusic. Retrieved 1 April 2013. ^ "How to Play the 5-String Banjo Releases". AllMusic. Retrieved 14 May 2013. ^ Ruhlmann, William. "Bantu Choral & Folk Songs". AllMusic. Retrieved 1 April 2013. ^ Hinkle, Bob. "Birds, Beasts, Bugs and Little Fishes". AllMusic. Retrieved 1 April 2013. ^ Ruhlmann, William. "Birds, Beasts, Bugs & Bigger Fishes". AllMusic. Retrieved 1 April 2013. ^ Ruhlmann, William. "Camp Songs". AllMusic. Retrieved 1 April 2013. ^ Ruhlmann, William. "Birds, Beasts, Bugs & Bigger Fishes". AllMusic. Retrieved 2 April 2013. ^ Ruhlmann, William. "Love Songs for Friends and Foes". AllMusic. Retrieved 2 April 2013. ^ Ruhlmann, William. "American Industrial Ballads". AllMusic. Retrieved 2 April 2013. ^ Ruhlmann, William. "American Ballads". AllMusic. Retrieved 2 April 2013. ^ Elder, Bruce. "American Favorite Ballads, Vol. 1". AllMusic. Retrieved 2 April 2013. ^ Elder, Bruce. "American Favorite Ballads, Vol. 2". AllMusic. Retrieved 2 April 2013. ^ Ruhlmann, William. "Gazette, Vol. 1". AllMusic. Retrieved 2 April 2013. ^ Ruhlmann, William. "Sleep-Time: Songs & Stories". AllMusic. Retrieved 2 April 2013. ^ Ruhlmann, William. "Abiyoyo and Other Story Songs for Children". AllMusic. Retrieved 2 April 2013. ^ Ruhlmann, William. "American Favorite Ballads, Vol. 3". AllMusic. Retrieved 2 April 2013. ^ Ruhlmann, William. "American Play Parties". AllMusic. Retrieved 2 April 2013. ^ Unterberger, Richie. "Folk Songs for Young People". AllMusic. Retrieved 2 April 2013. ^ Ruhlmann, William. "Nonesuch and Other Folk Tunes". AllMusic. Retrieved 2 April 2013. ^ Ruhlmann, William. "Champlain Valley Songs". AllMusic. Retrieved 2 April 2013. ^ Ruhlmann, William. "Song and Play Time with Pete Seeger". AllMusic. Retrieved 2 April 2013. ^ Ruhlmann, William. "Songs of the Civil War". AllMusic. Retrieved 2 April 2013. ^ Mason, Stewart. "Story Songs". AllMusic. Retrieved 2 April 2013. ^ "Songs of Memphis Slim and Willie Dixon". AllMusic. Retrieved 2 April 2013. ^ Mason, Stewart. "Indian Summer". AllMusic. Retrieved 2 April 2013. ^ Ruhlmann, William. "American Favorite Ballads, Vol. 4". AllMusic. Retrieved 2 April 2013. ^ Ruhlmann, William. "Gazette, Vol. 2". AllMusic. Retrieved 2 April 2013. ^ Ruhlmann, William. "Songs of the Spanish Civil War, Vol. 1". AllMusic. Retrieved 2 April 2013. ^ Unterberger, Richie. "Activity Songs". AllMusic. Retrieved 2 April 2013. ^ Eder, Bruce. "American Favorite Ballads, Vol. 5". AllMusic. Retrieved 2 April 2013. ^ Ruhlmann, William. "The 12-String Guitar as Played by Leadbelly". AllMusic. Retrieved 2 April 2013. ^ Ruhlmann, William. "Broadside Ballads, Vol. 2". AllMusic. Retrieved 2 April 2013. ^ Ruhlmann, William. "Broadsides: Songs and Ballads". AllMusic. Retrieved 2 April 2013. ^ Ruhlmann, William. "God Bless the Grass". AllMusic. Retrieved 2 April 2013. ^ Ruhlmann, William. "Dangerous Songs!?". AllMusic. Retrieved 2 April 2013. ^ Mason, Stewart. "Waist Deep in the Big Muddy and Other Love Songs". AllMusic. Retrieved 2 April 2013. ^ Ruhlmann, William. "Sings Traditional Christmas Carols". AllMusic. Retrieved 2 April 2013. ^ Ruhlmann, William. "Pete Seeger Now". AllMusic. Retrieved 2 April 2013. ^ "Tell Me That You Love Me, Junie Moon". AllMusic. Retrieved 2 April 2013. ^ Ruhlmann, William. "Pete Seeger Young vs. Old". AllMusic. Retrieved 2 April 2013. ^ Ruhlmann, William. "Rainbow Race". AllMusic. Retrieved 2 April 2013. ^ Ruhlmann, William. "Banks of Marble and Other Songs". AllMusic. Retrieved 2 April 2013. ^ Ruhlmann, William. "Pete Seeger & Brother Kirk Visit Sesame Street". AllMusic. Retrieved 2 April 2013. ^ Ruhlmann, William. "Fifty Sail on Newburgh Bay". AllMusic. Retrieved 2 April 2013. ^ Ginell, Richard S. "Circles and Seasons". AllMusic. Retrieved 2 April 2013. ^ Ruhlmann, William. "A Fish That's a Song". AllMusic. Retrieved 2 April 2013. ^ Ruhlmann, William. "Pete". AllMusic. Retrieved 2 April 2013. ^ a b c d "Past Winners Search". The GRAMMYs. Retrieved 2014-01-24. ^ "Tomorrow's Children - Rivertown Kids, Pete Seeger". AllMusic. Retrieved 2014-01-24. ^ Poet, J. "A More Perfect Union". Retrieved 2 April 2013. ^ Leggett, Steve. "Pete Remembers Woody". Retrieved 2 April 2013. ^ Elder, Bruce. "A Pete Seeger Concert". AllMusic. Retrieved 1 April 2013. ^ Ruhlmann, William. "Pete Seeger". AllMusic. Retrieved 1 April 2013. ^ Ruhlmann, William. "With Voices Together We Sing". AllMusic. Retrieved 1 April 2013. ^ Ruhlmann, William. "Pete Seeger and Sonny Terry at Carnegie Hall". AllMusic. Retrieved 1 April 2013. ^ Ruhlmann, William. "Hootenanny at Carnegie Hall". AllMusic. Retrieved 1 April 2013. ^ Ruhlmann, William. "Pete Seeger at the Village Gate with Memphis Slim & Willie Dixon". AllMusic. Retrieved 1 April 2013. ^ Ruhlmann, William. "Sing Out with Pete!". AllMusic. Retrieved 2 April 2013. ^ Ruhlmann, William. "Pete Seeger at the Village Gate, Vol. 2". AllMusic. Retrieved 2 April 2013. ^ Ruhlmann, William. "The Bitter and the Sweet". AllMusic. Retrieved 2 April 2013. ^ Elder, Bruce. "Children's Concert at Town Hall". AllMusic. Retrieved 2 April 2013. ^ Mason, Stewart. "Pete Seeger at Carnegie Hall". AllMusic. Retrieved 2 April 2013. ^ Ruhlmann, William. "Sing Out! Hootenanny". AllMusic. Retrieved 2 April 2013. ^ Ruhlmann, William. "I Can See a New Day". AllMusic. Retrieved 2 April 2013. ^ Ruhlmann, William. "Sing with Seeger!". AllMusic. Retrieved 2 April 2013. ^ Ruhlmann, William. "Strangers and Cousins". AllMusic. Retrieved 2 April 2013. ^ Ruhlmann, William. "WNEW's Story of Selma". AllMusic. Retrieved 2 April 2013. ^ Ruhlmann, William. 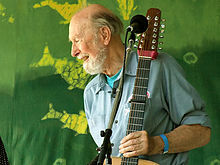 "Pete Seeger Sings and Answers Questions at Ford Forum Hall Boston". AllMusic. Retrieved 2 April 2013. ^ Ruhlmann, William. "Singalong Demonstration Concert". AllMusic. Retrieved 2 April 2013. ^ Ruhlmann, William. "Pete Seeger's Family Concert". AllMusic. Retrieved 2 April 2013. ^ Ruhlmann, William. "Live at Newport". AllMusic. Retrieved 2 April 2013. ^ "Live in Lisbon". AllMusic. Retrieved 2 April 2013. ^ "In Prague 1964". AllMusic. Retrieved 1 May 2016. ^ Ruhlmann, William. "Live in 65". AllMusic. Retrieved 23 December 2013. ^ "The Complete Bowdoin College Concert 1960". AllMusic. Retrieved 23 December 2013. ^ Ruhlmann, William. "Washboard Band: Country Dance Music". AllMusic. Retrieved 27 May 2013. ^ "Washboard Band: Country Dance Music Releases". AllMusic. Retrieved 14 May 2013. ^ Ruhlmann, William. "Songs of Struggle & Protest: 1930–1950". AllMusic. Retrieved 27 May 2013. ^ "Songs of Struggle & Protest: 1930–1950 Releases". AllMusic. Retrieved 27 May 2013. ^ Ruhlmann, William. "Pete Seeger Sings Woody Guthrie". AllMusic. Retrieved 27 May 2013. ^ "Pete Seeger Sings Woody Guthrie Releases". AllMusic. Retrieved 27 May 2013. ^ Ruhlmann, William. "Pete Seeger Sings Leadbelly". AllMusic. Retrieved 27 May 2013. ^ "Pete Seeger Sings Leadbelly Releases". AllMusic. Retrieved 27 May 2013. ^ Ruhlmann, William. "Wimoweh (And Other Songs of Freedom and Protest)". AllMusic. Retrieved 27 May 2013. ^ "Wimoweh (And Other Songs of Freedom and Protest) Releases". AllMusic. Retrieved 27 May 2013. ^ Ruhlmann, William. "The World of Pete Seeger". AllMusic. Retrieved 27 May 2013. ^ "The World of Pete Seeger Releases". AllMusic. Retrieved 27 May 2013. ^ Lankford, Jr., Ronnie D. "The Essential Pete Seeger". AllMusic. Retrieved 27 May 2013. ^ "The Essential Pete Seeger Releases". AllMusic. Retrieved 27 May 2013. ^ Ruhlmann, William. "We Shall Overcome: The Complete Carnegie Hall Concert". AllMusic. Retrieved 27 May 2013. ^ Ruhlmann, William. "Folk Music of the World". AllMusic. Retrieved 27 May 2013. ^ "Folk Music of the World Releases". AllMusic. Retrieved 27 May 2013. ^ Small, Hank. "Clearwater Classics". AllMusic. Retrieved 27 May 2013. ^ Eder, Bruce. "Pete Seeger Concert/Pete! Folk Songs and Ballads". AllMusic. Retrieved 27 May 2013. ^ Ruhlmann, William. "A Link in the Chain". AllMusic. Retrieved 27 May 2013. ^ "Best of Pete Seeger". AllMusic. Retrieved 27 May 2013. ^ Ruhlmann, William. "Birds, Beasts, Bugs and Fishes (Little & Big)". AllMusic. Retrieved 27 May 2013. ^ McDonald, Steven. "For Kids and Just Plain Folks". AllMusic. Retrieved 27 May 2013. ^ Unterberger, Richie. "If I Had a Hammer: Songs of Hope & Struggle". AllMusic. Retrieved 27 May 2013. ^ Leggett, Steve. "The Original Folkways Recordings". AllMusic. Retrieved 27 May 2013. ^ "The Original Folkways Recordings Releases". AllMusic. Retrieved 27 May 2013. ^ Unterberger, Richie. "Headlines and Footnotes: Collection of Topical Songs". AllMusic. Retrieved 27 May 2013. ^ Ruhlmann, William. "Pioneer of Folk". AllMusic. Retrieved 27 May 2013. ^ "Pioneer of Folk Releases". AllMusic. Retrieved 27 May 2013. ^ Unterberger, Richie. "American Folk, Game and Activity Songs for Children". AllMusic. Retrieved 27 May 2013. ^ Unterberger, Richie. "Greatest Hits". AllMusic. Retrieved 27 May 2013. ^ Leggett, Steve. "Seeds: The Songs of Pete Seeger, Vol. 3". AllMusic. Retrieved 27 May 2013. ^ Deming, Mark. "The Essential Pete Seeger". AllMusic. Retrieved 27 May 2013. ^ "Pete Seeger Album Chart History". Billboard. Retrieved 2013-04-01. Dunaway, David King (2009). How Can I Keep from Singing? : The Ballad of Pete Seeger. Random House Publishing Group. ISBN 978-0-307-49597-6. Dunaway, David King (2010). A Pete Seeger Discography: Seventy Years of Recordings. Lanham, MD: Scarecrow Press. ISBN 978-0810877184. Popoff, Martin (2010). Goldmine Standard Catalog of American Records, 1948–1991 (7 ed.). Iola, WI: Krause Publications. ISBN 9781440211317. Winkler, Allan M. (2009). "To Everything There is a Season": Pete Seeger and the Power of Song. Oxford University Press. ISBN 978-0-19-971725-5. This page was last edited on 10 July 2018, at 03:16 (UTC).